Ø§ÙØ³Ø¹ÙØ¯ÙØ© follow link click What is SpLD? Specific Learning Difficulties (SpLD), affect the way information is learned and processed. They are neurological (rather than psychological), usually run in families and are independent of intelligence. They can greatly impact on education, partly due to difficulties in processing information, literacy and numeracy skills. 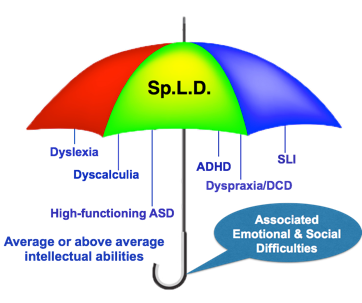 SpLD is an umbrella term used to cover a range of difficulties that can overlap with each other. ASD (such as Asperger Syndrome). ‘Learning Difficulties’ or ‘General learning difficulties’. These terms apply to people with overall difficulties in intellect and functioning, rather than ‘specific’ difficulty in specific areas of functioning. A student may be diagnosed with SpLD where there is a large gap between their achievement and intellectual ability (Sometimes described as having ‘a spiky profile’). Students with SpLD all show different intellectual and emotional profiles, strengths and weaknesses, learning styles and life experiences. SpLD is a distinctive patterns of difficulties, and relate to the processing of information, ranging from very mild to severe. These may result in limitations in literacy, language, number, motor function and organisational skills. Children who are in a potentially failing situation can become delicate. This will impair their ability to learn and co-operate with other children and adults. They may have specific learning difficulties, or are ‘delicate’ / ‘vulnerable’ because of change in their situation at home or school. There may be educational, social or medical reasons for a child being described as delicate or vulnerable. It is important to address this as a priority otherwise their emotional needs can prevent their learning in school. At Red Rose School we place a high priority on providing a learning environment that caters for diverse emotional and learning needs, to help children achieve their potential. Just as a parent eagle shields and cares for its young, the school’s aim is to shield and care for the pupils in its charge. All of our pupils have felt previous ‘failure’ caused by their learning difficulties and, as such, it is vital that they feel safe and unthreatened in their new school environment. Pupils must learn to trust before they can be successful in learning. This can only be achieved by staff establishing a caring relationship with each child in their charge. This is enabled by maintaining very small class sizes (9 or fewer pupils per class). When the young eagle reaches maturity the mother eagle takes away the nest from underneath. The eaglet tumbles but is caught and carried to safety by its parent. This process is repeated until nature takes over and the eaglet spreads its wings and flies for the first time. Soon the young eagle is independent and able to soar above the storms. This is the challenge needed for our pupils! Once they have regained confidence, we stretch or challenge their abilities and skills until they can ‘fly’ on their own. Our job is complete; and the door is opened to successfully reintegrate back into mainstream school or go on to their chosen college. The current aim of inclusion through the government’s Special Educational Needs Code of Practise is that the needs of all children, including those with Special educational needs, will be met in the mainstream setting wherever possible. At Red Rose we are committed to the principles of inclusion, of social equality and full curriculum access for all children. Some children, however, because of their social, emotional or learning needs may not be able to learn or cope in a mainstream setting. Our aim is to build resilience and promote the skills needed, so children have opportunity to re-enter mainstream education at the appropriate time. We firmly view our role as part of the inclusive educational process with the local education authorities who place children at our school. Most of the children in our school have felt failure in their previous setting and, have low levels of self esteem, as well as low attainments. We offer a specialised resource to help each child progress emotionally and academically. This may enable a child to re-enter mainstream school or, dependent on varying factors including social or emotional needs, he or she may grow within the school until transition to further education. There are numerous examples of children whose expectations and future achievements are the fruits of the supportive framework within the school. At Red Rose School we see ourselves as a vital part in the full inclusion process for all children with specific social, emotional, communication and learning needs (from Dyslexia and Inclusion: Classroom Approaches for Assessment, Teaching and Learning. Reid, G. 2004, David Fulton/NASEN publications). An early sign of progress in all our students is the strides of improvement to their self esteem. Part of our package for progress is to ensure each child has a high ratio of teacher attention (class sizes consist of 9 or fewer children to 1 teacher and 1 or more Teaching Assistants) and personalised provision. Of the 150+ students who have left the school the average improvement in basic skills is 8, 7 and 8 years for reading, spelling and number respectively.